Welcome to BEARTRAP RANCH a unique Montana ranch available for vacation rental and special events. Experience genuine Montana living with end of the road privacy! At the crossroads between luxury retreat and untouched wilderness exists BEARTRAP RANCH. Amidst a back drop of sheer beauty our 160 acres of private ranch land provides you the opportunity to be a part of the old west or just get away from the daily stresses. 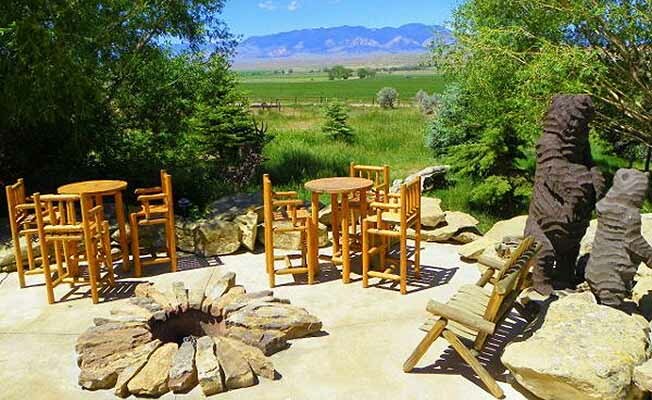 BEARTRAP RANCH is a custom ranch home built by a former outfitter and master stone mason. The home has been ever evolving through Gary's vision over the last 15+ years. It is approx 3500 square feet with 3 bedrooms and 3 baths. Features include: two fireplaces, waterfall wet sauna, gameroom, trophy room /bar area with big screen tv, weightroom, living/dining room and fully equipped kitchen. Custom stone floors and rockwork throughout the home as well as Gary's hunting memorabilia. There are two patio areas that include, hot tub, firepit, outdoor shower, and plenty of seating to catch the views!! Also has an extra suite that has two bed rooms and deck with great view. Located in the Clarks Fork Valley about 50 miles from Cody, Wyoming and a little over 60 miles from Billings, Montana. We are only 20 miles from the town of Red Lodge, MT. New this year: several full RV hook-ups, 2 woodfloor teepees with bathhouse and laundry service, 2 brand-new cabins. Something for everyone. No matter your budget we can accommodate your needs!